Google announced today that it will host three day long digital skills training sessions in Connecticut during the week of February 11, making stops in Hartford, New Haven and New London. The effort put on by Grow with Google (the company’s economic opportunity initiative) is part of a national tour of libraries in all 50 U.S. states to equip people with requisite skills to thrive in the digital economy. Each stop will consist of free hands-on courses in an array of tech topics, aimed at job seekers, small business owners, students, educators and entrepreneurs to improve their digital skills. “Connecticut is one of our country’s most historic centers of innovation, entrepreneurship and manufacturing. By bringing the ‘Grow with Google’ tour to the state, we are making a commitment to help develop a skilled workforce that can meet the needs of the Constitution State’s growing economy,” said Erica Swanson, Google’s Head of Community Engagement. Each event will include Google staff leading interactive workshops about issues ranging from search engine optimization and online marketing to coding and email basics. 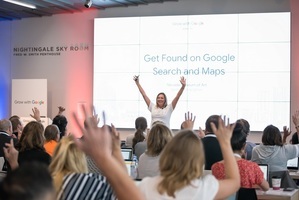 Attendees can also sign up for one-on-one training with Google staff, and tour demo booths to learn more about Google’s free products for learners and small businesses. Google is officially partnering with Hartford Chamber of Commerce, Hartford Public Library, New Haven Free Public Library, and Public Library of New London as well as the American Library Association for the trip, and will explore partnership opportunities with area organizations to help with job training and developing digital skills. To learn more about the free event and to register, visit g.co/growconnecticut. Space will be limited; so please register in advance. In its 2017 Economic Impact Report, Google found that 14,000 Connecticut businesses generated $4.13 billion in economic activity by using Google’s search and advertising tools.